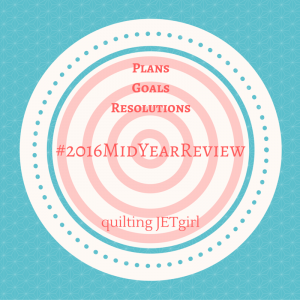 At the start of the year Yvonne, from Quilting Jetgirl, hosted a yearly goal setting linkup. Being the list maker that I am, I was already doing this but putting it out there for all to see was my way of holding myself accountable. The year is already half over and Yvonne has asked us to post how we're doing. Full disclosure -- I haven't looked at this list since I posted it so this will help to remind me of what I have to work on for the next 6 months. 1. More selfish sewing - I've not done very well on this goal since there's always a gift project on the horizon. And now, with the Pulse charity drive, every spare sewing moment is spent trying to get these done as quickly as possible. But I'm okay with that. I did purchase a new pattern a few days ago, Bubbles, that I'm going to start working on. I'd love to start making 1 block a month beginning in September when I'll have more sewing time. 2. Wardrobe Makeover - I've definitely made some progress on this goal and now have clothes that fit me. This is an ongoing goal in order to spread out the cost. 3. Declutter and organize my everyday life - I've also made some progress on this goal as well. I've donated several bags/boxes of household items and clothes over the past 6 months. Whenever I buy a new piece of clothing, I try to look in my closet to see if there is something that can also be donated so that I keep a status quo. For these next 6 months, I want to challenge myself to tackle the dreaded junk drawer in the kitchen and my sewing room drawers with all of my machine accessories and notions. 4. Become a mentorI - Now that the school project is finished I'm not sure what will be next but since my son has taken an interest in sewing that sort of qualifies. 2015 Stash Bee quilt - Turquoise Facets is done. My Midnight Mystery quilt - Moroccan Tiles - the top is completely done but I need to have a longarmer quilt this. There's no way I can quilt a queen size quilt on my machine. Heck, I don't even have enough space anywhere in my house to baste it! I'm hoping to give it to my friend Frank to quilt at his leisure. He does amazing work. My Pinwheel quilt. - No progress has been made on this one. Maybe I'll be able to add the outer border so that it's ready to quilt, but thinking realistically this won't get finished until 2017. 7. Cut into some of my layer cakes - Ummm... yeah. No progress on this one either. But I do have a solid plan for my April Showers layer cake and have even purchased the necessary background fabric. Again, this is on the back burner until my guild gets all the Pulse quilts finished. 8. Create and stick to a routine that works for me to achieve a better balance of work, home, and leisure time - This is always going to be a work in progress for me. I mentioned in my goal setting post that I've never really used a physical planner before and while I love the design and the concept of the Quilter's Planner it didn't help me to manage things. The planner was too big for me to carry around and since my husband and I use a shared calendar (with tasks & reminders), it was too redundant to transfer everything into the planner each week. For the remainder of the year, I'm going to try and use the planner specifically for sewing goals and tasks and keep it in my sewing room. 9. 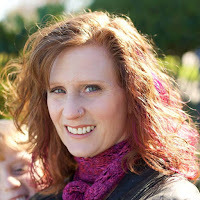 Blog more regularly - I think I'm doing pretty well with this goal. I try to write/schedule at least 1 blog post a week and I even managed to have them build up enough to post while I was on vacation. My bonus goal that went along with this was to make some cosmetic changes to my blog. I'm happy to say that I accomplished that. I created a new banner and signature for the blog. Lightened up the background and redid my social media icons (again). I'm much happier with the cleaner look of the blog. It's been good to reflect back on these. Now to see if I can follow through by the end of the year. I'd say you've made great progress on your goals Diana. I'm sure everyone in the Orlando Guild is sewing their fingers off. That's a big commitment and you are all wonderful for doing it. This is a lofty list. You have certainly achieved a large portion of it. Wild it be more manageable. To pick the three or four goals most important to you, and see what you can do with those over the last half of the year? Being a working mom with a little one. It must be a challenge to strike that balance. Go Diana! good to see most of your to do goals have materialised. What I wonder do you meant find some wall decorations surely you will make some? Decluttering is going well, I too need to do some, would love to donwsize to a smaller place and would have to do it then. Have fun with the star wars theme it will be lovely to work together on it. Good to read the heart quilts are coming along well, the lady I sent my blocks to has made 2 quits so far and still has more blocks to make more, such a worthwhile project which I am sure will help bring comfort to those who lost loved ones. Oh it's hard to be selfish isnt' it? But by making that a priority, you may find that you make more progress in other parts of your life. So I wish you luck with that particular goal. I find it hard as well to carve out personal sewing time. I should make that a goal for me too! You did so well, I wish I did too! Congratulations for your finished quilt, and your new project, Bubbles is beautiful! I will come back to watch your WIP.